I would have given you a prize. This piece is stunning! 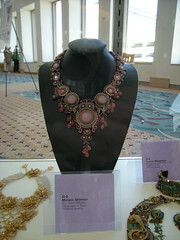 This necklace is fantastic and should have won the first prize!! Dear Miriam being accepted into bead dreams and on display is a huge prize and a well deserved one, congratulations! Miriam, YOU are a winner! thank you for all of your encouragement and like Connie said, I would have given you a prize too! I love beading too much and really appreciate your craftsmanship! I got some aquamarine beads and would love to great necklace as shown above. As beautiful almost angelic your work is. The day will never come I would dare to send mine in. I know what you mean about coping your designs. My Grandma used to say it is an Honor for someone to think enough of your work to copy it .Didn't really take the sting out but it was better than letting my mind lose. Love to You and to those You Love.